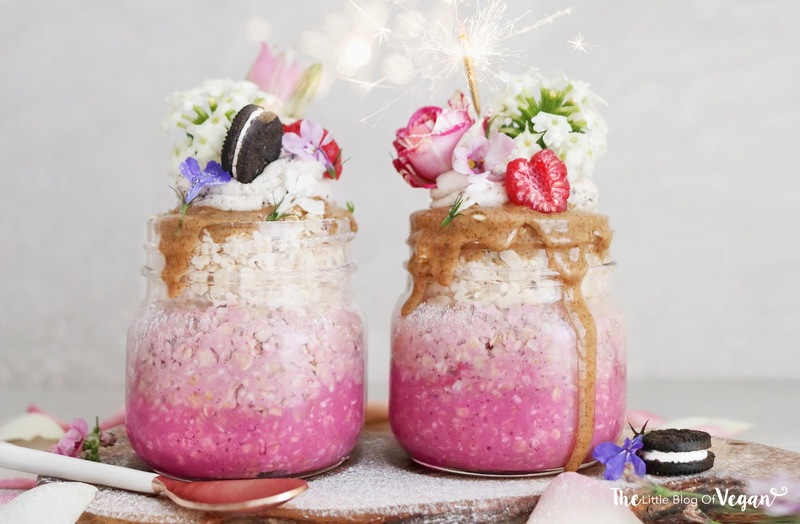 Overnight oats are perfect if you don't have time in the morning to make a healthy and filling breakfast! They're a blend of oats, milk, sweetener and a flavour of your choice. I made these raspberry ombré overnight oat pots which are not only visually stunning but very delicious. Both 100% vegan, gluten-free and contains only natural sugars. Overnight oats are extremely versatile, and just like a classic warm bowl of oatmeal... they're easy to make. Oats are nutritious and rich in antioxidants, great for a morning boost. These overnight oats are perfect for a quick & easy breakfast! You can top them off with anything you fancy. Step 1- Place the porridge oats into a large bowl and pour in the dairy-free milk, maple syrup. Add some chia seeds (optional). Step 2- Separate the oat mixture into 3 bowls. Leave one bowl plain, add in raspberry powder to the second and a little more into the third to create the ombré effect. Step 3- Layer (ombré) the oat mixture into some jars and pop into the fridge overnight. I topped off the overnight oats with some coconut cream, almond butter, fresh berries, a mini Oreo and flowers. Best enjoyed fresh within 2 days. Keep refrigerated.